Emerald Environmental Technologies ice3 Cube System utilizes an ultra-low charge of R410A refrigerant resulting in an eco-friendly commercial refrigeration system. 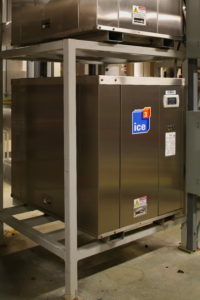 The ice3 Cube System is a custom modular design, ammonia-free, eco-friendly commercial refrigeration systems focusing on efficient refrigeration operations able to capture and reuse what would be waste heat from the ice rink refrigeration process, geothermal chiller, and cold/warm water systems back into the facilities enabling heating and air conditioning applications. Emerald Environmental Technologies ice3 Cube System fully embraces the “use it or lose it” mantra. By directing what would be waste heat from your refrigeration or air conditioning system to other facility needs, waste heat becomes an asset waiting to be harnessed and is a primary consideration in all of our designs. Emerald Environmental Technologies’ ice3 Cube System provides an eco-friendly refrigeration system for ice rinks providing endless possibility paths to take an out-of-date ammonia based ice rink refrigeration system and use “total heat reclamation” to provide an ammonia-free, eco-friendly refrigeration system for your hockey rink or commercial space. The original Ice Kube Solutions design of St. Paul, Manitoba was the original ammonia retrofit – and the Ice Kube heat pumps were a brilliant alternative to the ammonia-free ice rink refrigeration systems already in place. Dora purchased the Kube technology from IKS, the original owner. Dora Construction from Nova Scotia owned the original Canadian rights to the technology and sold them as Kube Solutions. Eventually Kube Solutions of St. Paul Manitoba placed their company and the Kube technology up for sale. In a natural progression, a partnership with Andrew Grignon, and other investors created Emerald Environmental Technologies to produce the updated and superior ice3 Cube System utilizing an ultra-low charge of R410A refrigerant resulting in an eco-friendly commercial refrigeration system. In 2014 Emerald Environmental Technologies applied for a patent for the updated technology and was relocated to Holderness, New Hampshire. Emerald Environmental Technologies’ engineering department was especially enamored by the simplistic beauty of an R410A refrigeration systems and how it worked, and saw multiple opportunities to redesign and re-engineer the modular units paying attention to design and function elements that frustrated ice makers in the original design. Full production of the Emerald Environmental Technologies’ ice3 Cubes was offered to the open market in 2014. Today Emerald Environmental Technologies have ice3 Cubes installed in ice rinks, and other facilities such as a penitentiaries, museums, and private businesses up and down the east coast in Canada and the U.S.